Some fashion folk are suggesting that the end is nigh for the skinny jean. The boyfriend has made a welcome appearance, wide leg pants are the shape of the winter (check me out last Christmas day! We have the trends for you a whole year early!) but who hasn’t had a moment of panic when in a rush to get out and reached for their trusty dark denims? Pair ’em with boots, with heels, with flats; woolen jumper, t-shirt, white shirt – they can be styled so many ways, and contrary to some belief they suit all shapes and sizes if you persevere to find the right fit. If you’re a bit disgusting like me you could easily wear them every day in a working week and come up with 5 distinct outfits; which is just what I’m going to do! 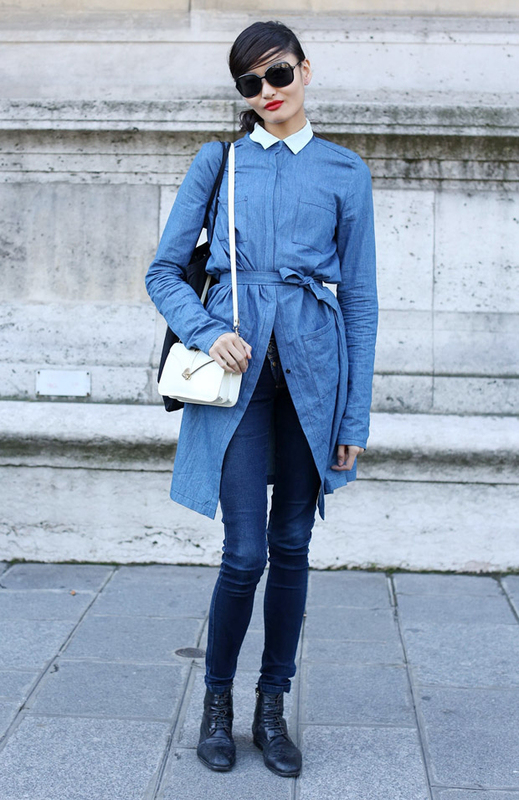 Make like this laissez-faire lady and go double denim on the most exhausting day of the week. I’m never prepared for Monday, so this denim shirt-dress (pick one up in Penney’s, got one just like it last weekend! ), comfy boots and skinnies combo is ideal. Look, you don’t even have to bother thinking about jewellery, just a bag-eyed covering pair o’ shades! Don’t forget the don’t-mess-with-me red lipstick! After a lazy evening the previous day, you can afford to put a bit more effort into Tuesday’s look, and trust me your friends/family/work colleagues will thank you for it. 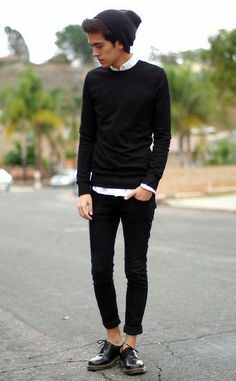 A white shirt is perfect with your skinnies, and with a cute boater hat, lovely sandals (frostbite? the latest winter trend!) and co-ordinating bangles you’ll be all set. It’s mid-week already, you’re starting to feel drained, so perk yourself up and get thee to a gig. The blogger above has matched her orange shoes to a similar shade in her t-shirt; such an underestimated style trick. Stick on a cute blazer and a simple necklace and you’re off! Following your night out you’ll want something simple and easy to pull together (do it before you go to bed!). Or just pull that white shirt from Tuesday out of the wash basket and pop a skinny knit over it; ta-da! Pull a beanie over your hair or stick it up in a bun and finish with docs or brogues. Yes, it’s a gent in the pic above, and he has it down; I’d totally wear that! Nothing like a mad pair of shoes to add interest to your outfit. I love Irregular Choice, or just pick up a cheapo pair in Dunnes or New Look; because they’re so statement you won’t wear them that much, so they won’t fall apart immediately! I love fire-engine red with navy, and a red wooly is an interesting alternative to the greys doing the rounds at the moment. It’s dress-down Friday with a difference, and will work all through the rest of the weekend. You can find a good pair of dark denim skinnies in plenty of outlets; Penney’s are good for stretch and once you find your perfect fit in Topshop or Oasis you’re set (for life, practically). I also spied a few good ones on ASOS and Littlewoods. And no need to rush; I think we all know that the dark denim skinny jean is here to stay. This is the second in our Capsule Confidential series; see the first must have for your wardrobe here!